There's nothing better than a juice cleanse before AND after Spring Break! You want to feel great and cleansed before you slip into that bikini and a cleanse is definitely necessary after Spring Break with all that junk food- cause really, who eats healthy during Spring Break? Back in November, we tried out our first Pressed Juicery cleanse (read here) and we loved it- but because we were juice cleanse newbies, we did the 1-day cleanse! This time we thought we would step up our game and try out the 3-day cleanse! Check out what we all had to say about it below and don't forget to enter for a chance to win the giveaway! "I was really excited to try Pressed Juicery since the cleanse I did before (read here) went so well. The 1 Day Cleanse left me feeling refreshed and the 3 Day Cleanse was no different. I did Cleanse #2 and it had the best flavored juices. My favorite juice was Citrus 2 which combined apple, lemon, pineapple, and mint together. Their flavors are so yummy that it made the Cleanse #2 enjoyable. Tip: To get through a cleanse, go to sleep early! Sleeping earlier at night after taking your last bottle of juice keeps you from being tempted by food!" "Cleansing for 3 days was a little scary at first, but I was up for the challenge! Day 1 was the hardest day for me. After getting over the first day, the last two days were much easier! 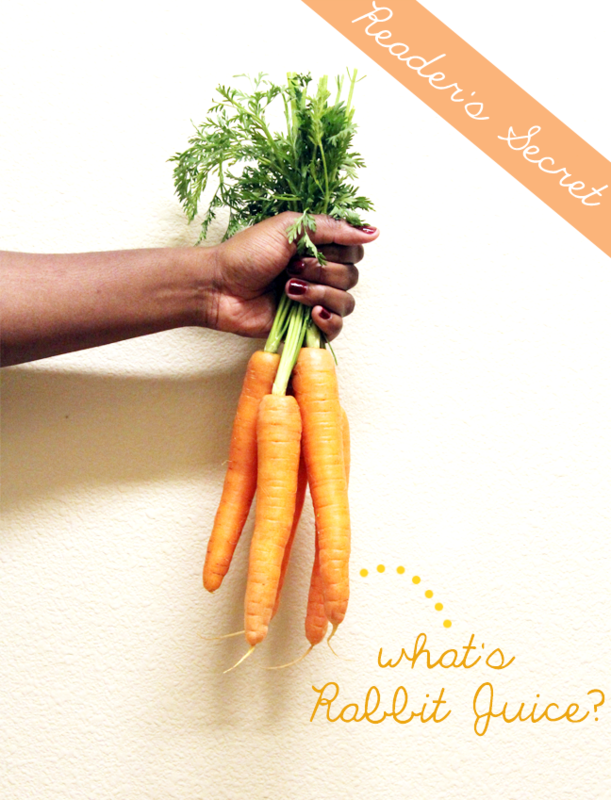 I got into the routine of juicing, and I didn't have to think about it as much. I kept reminding myself to chug that water throughout the day as well! I did get a little tired on Day 2 in the afternoon, but having my next juice helped to give me energy. In the mornings when I woke up, I found that I felt especially great! I felt light and well rested. I feel lean and fresh for spring break! Doing the Pressed 3-day cleanse is like a spring cleaning for your body. Simply put, I feel refreshed. I also feel very hydrated, and ready to take on the day! Thank you Pressed Juicery!!" "I've juiced quite a few times in the past so I thought I'd give Cleanse #3 a try! I've only done a 2-day juice cleanse so I was excited to do a 3-day cleanse! Cleanse #3 is more for "experienced cleansers," and contains only one almond milk and more green juices. I was a bit nervous at first, but it ended up going really well! I always had a big bottle of water next to me at all times to chug and I think the most important thing to do is to space out your juices throughout the day! I tend to get hungry and want to snack at night, so I made sure that I had plenty of juice to drink in the evening and went to bed early! By the end of my cleanse, I felt great and energized! From being so hydrated for 3 days, I felt really detoxed. By far my favorite cleanse I've done and saw the most results!" 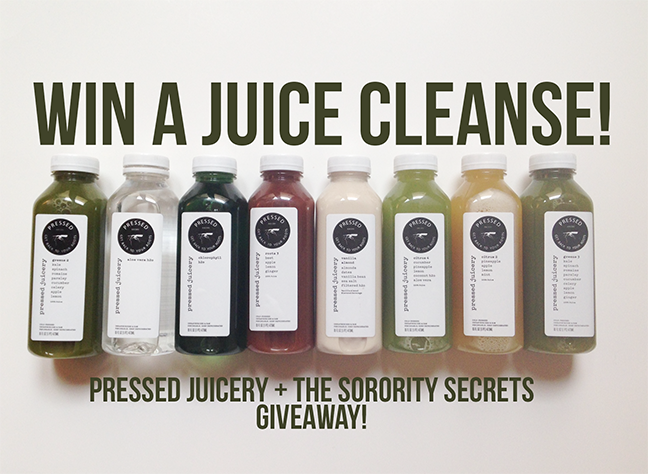 Step 3: Email us at giveaway@thesororitysecrets.com by March 21, 2014 and tell us about a time you've done a juice cleanse before and your experience! 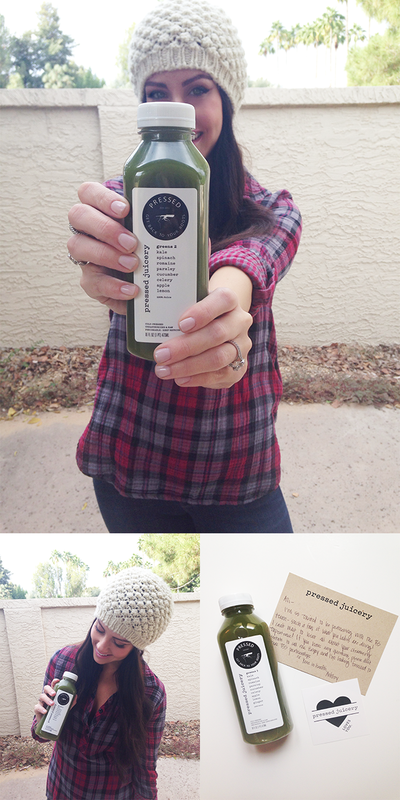 If you haven't done a juice cleanse yet, say why you'd like to win this giveaway and try out a juice cleanse! 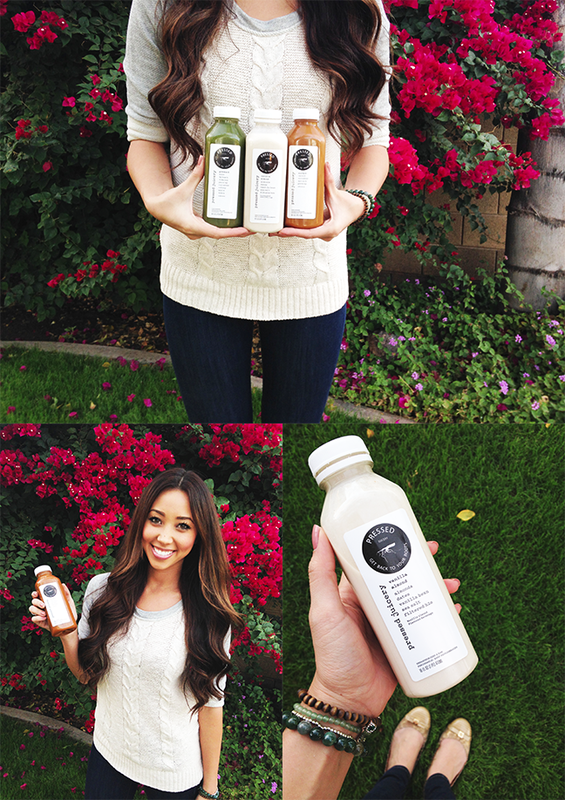 A special thank you to Pressed Juicery for an amazing cleanse! Make sure to visit their website at www.pressedjuicery.com for more information on their juice cleanses! That's right! We're giving away one 1-day Pressed Juicery juice cleanse to one lucky winner! There are three different juice cleanses and all three founders did three different kind so you can always refer back to their Detox Diaries to choose which cleanse you want to go with! 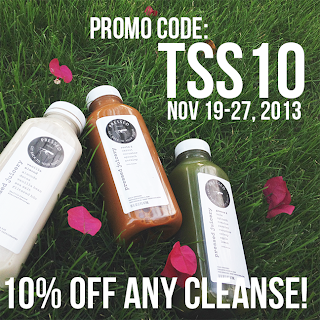 We also have a promotional code for a 10% off discount for any Pressed Juicery cleanses for all TSS readers going on right now until November 27th! So make sure you use our promo code: TSS10 to get your 10% off! Okay, okay- so you want to know how to win a juice cleanse?! 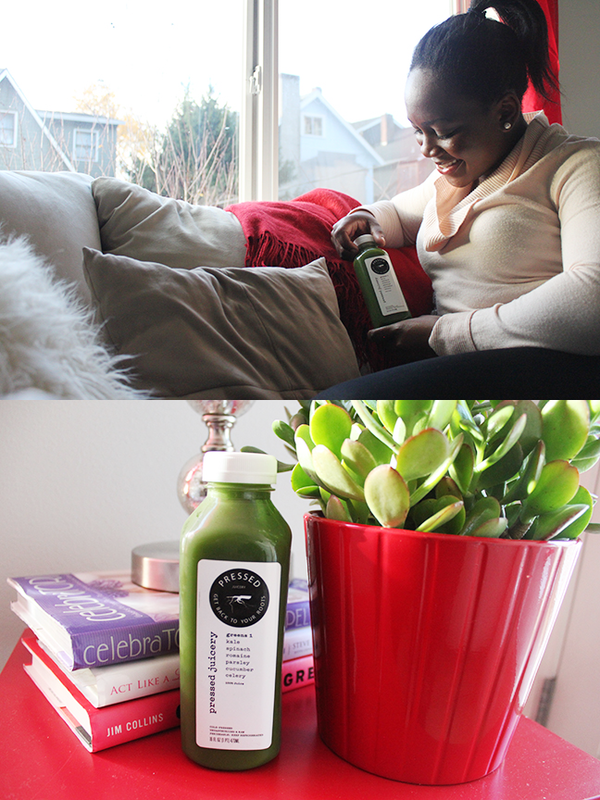 Option 2- Blog Comment: Tell us about a time you've done a juice cleanse before and your experience! If you haven't done a juice cleanse yet, why you'd like to win this giveaway and try out a juice cleanse! Please leave your email address along with your submission so we can contact you if you are the winner. The giveaway ends on November 27th! Thank you and good luck! Remember that if you don't win, you can always use the promo code until the 27th! Last week we announced our exciting new partnership with Pressed Juicery and over the weekend us three founders did 3 different one-day cleanses from Pressed Juicery to give you every detail on every cleanse available! 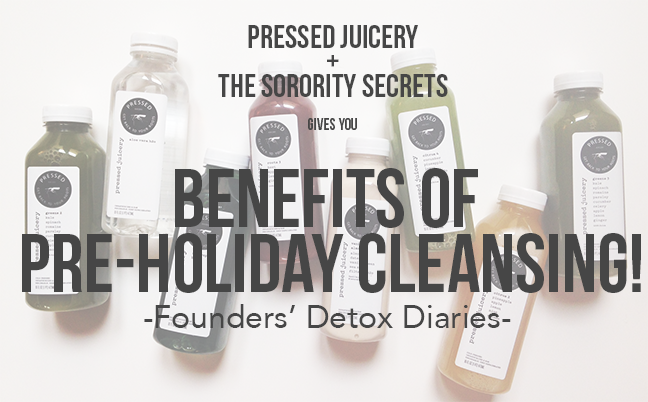 In addition, with the holiday season right around the corner, we thought we would share the benefits of pre-holiday cleansing and why you should cleanse before the holidays! We also have a little present for you at the end of today's post so make sure to check it out! Pressed Juicery cleanses comes with 6 different flavored juices per day and you can also add chlorophyll and aloe vera water to your day to help with digestion and to raise alkaline levels. With holidays right around the corner you need a lot of energy and stamina to get through all of the holiday parties, errands, and of course shopping! Another perk about juicing is that it helps give you a radiant complexion as well as healthy hair and nails so you can have that holiday glow at every holiday party you attend to this year! Pressed Juicery offers 3 different types of cleanses: Cleanse #1 is more for first-time juicers or athletes with higher caloric needs, Cleanse #2 is the most popular cleanse that are for those who want to maintain a healthy lifestyle, and Cleanse #3 is for experienced cleansers that love green juices! Check out our Detox Diaries below to see our experience on our one-day juice cleanses! "I was expecting to be starving during the cleanse but it was the opposite: I felt really good throughout the day. One of my favorite cleanses was the vanilla almond bottle. It had a lot of my favorite ingredients: almonds, dates, vanilla bean, sea salt, and filtered H20. I woke up feeling pretty refreshed and an urge to continue eating clean! Now, the big surprise! 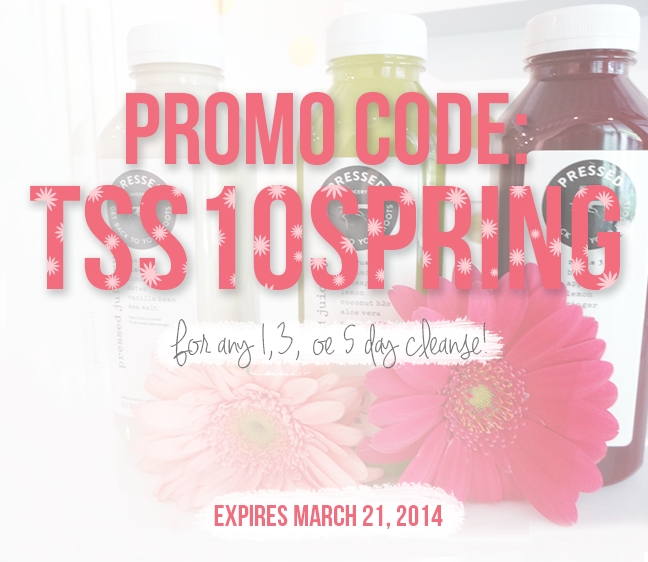 We have a special promo code for all of our loyal TSS readers to receive 10% off of any 1, 3, or 5 day juice cleanse from Pressed Juicery! Make sure to use promo code: TSS10 at www.pressedjuicery.com before the 27th and get your pre-holiday juice cleanse! We may have another surprise this week for one special reader so check back on TSS to find out all of the details! We want to thank the Pressed Juicery and their lovely team again for everything!